Decades after Dr. King’s murder, the FBI’s un-redacted letter, demanding that MLK kill himself, was made public on November 11, 2014. It was found by a Yale University historian, who was conducting research in the national archives. 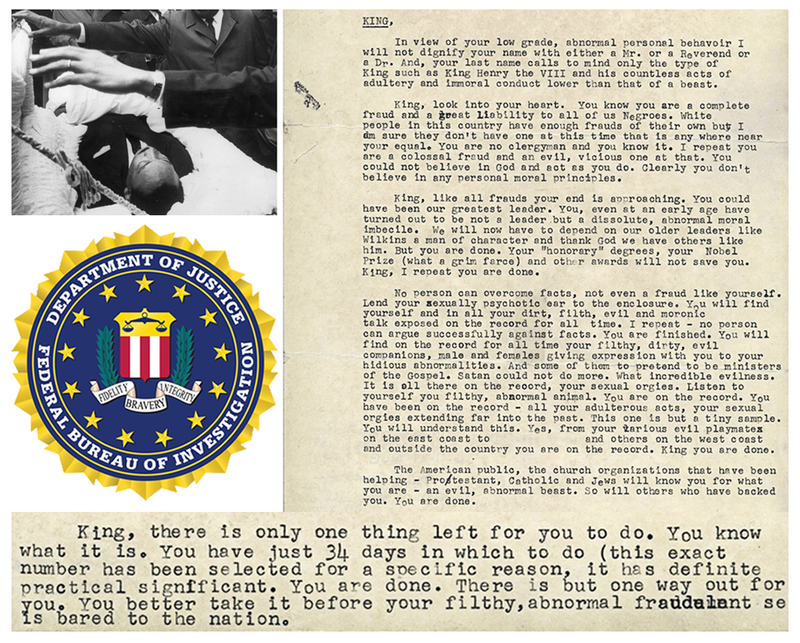 The letter is rife with vile descriptions and accusations, referring to Dr. King as “a colossal fraud and an evil, vicious one at that … dirt, filth, evil … evil, abnormal beast.” It concludes with a demand that MLK commit suicide within 34 days, or else compromising information about his alleged sexual indiscretions would be made public. When Dr. Martin Luther King Jr. received this letter, he told his friends that someone wanted him to kill himself. He also voiced his suspicions that the FBI’s infamous director, J. Edgar Hoover, was behind this demand. Hoover made no secret of his desire to see Dr. King discredited. The Senate’s Church Committee on intelligence overreach eventually confirmed Dr. King’s suspicion. The intelligence agencies insist on continuing their all-encompassing electronic surveillance, results of which are indefinitely stored. It isn’t difficult to imagine how the fruits of this poisonous tree could be gathered and used to blackmail political figures, whistleblowers or reluctant informants. One of many reasons why the surveillance state should not be allowed to run amok is the fact that it is being operated by human beings, capable of abuse and overreach that destroys the integrity of the justice system, as well as privacy, careers and lives of those who stand up against corruption.